If there’s one thing I’ve learned about systems and plans while raising twelve kids, it’s that systems and plans aren’t permanent. Like a baby’s sleep schedule, just when you think you’ve got it figured out, something changes. Even a system that has worked well for years can come to a point where it just isn’t effective anymore. And that’s where we were with our meal planning when I knew something had to change. For many years I have done our grocery shopping on Mondays because my husband gets paid weekly on Sundays. The important word there is “I.” Either I’ve been the only available person with a driver’s license or the other drivers have been obligated with classes or other responsibilities. When I had several young children and could leave them at home, grocery shopping was actually a bit of a break. As our family has grown and my life has changed to include a home business, grocery shopping has become more of a chore than a treat. For a period of time while I was sick with severe sinus issues, my husband or older son were able to take over. But life changed–it has a way of doing that–and the responsibility fell back to me. It didn’t take long for me to realize that solo grocery shopping wasn’t working for me. I realized it but didn’t do anything about it. Somehow I thought that things would settle down or I would get a handle on things. Didn’t happen. Finally, while wandering around inefficiently in the store one day, I determined to change our system. The first step was a family meeting, where I explained the need for change. I’m pretty sure we’ll have to go over this again. 1) We had gotten into a rut with meals, eating the same ol’ things. Each of the four girls (ages 8, 10, 14, and 16) went through back issues of old cooking magazines. Their assignment was to choose at least one new main dish to try, and write down an ingredient list to be used for shopping. This little exercise will be repeated. 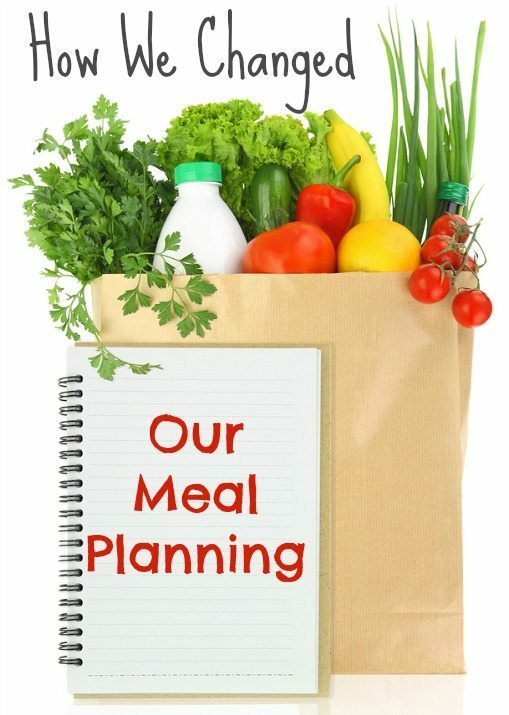 2) As a group, we discuss the meal list for the week and use that to make the final grocery list. Since they are the ones who clean the house, they often know better what we’re out of. This is the time for requests for treats or meals, and reminders about upcoming events. 3) On Monday evenings we either eat an early supper or treat ourselves to a favorite fast-food meal. Then all five of us (or six, if their brother joins us) head to the store. 4) We divide the list and send the older girls out on missions. The goal is to see how fast we can get in and out of the store! 5) The girls carry the groceries in and put them away. I personally like this part. 6) The girls are responsible to cook “their” meal during that week or the next. It had gotten to a point that my brain was so full that I literally couldn’t come up with a menu plan. You’d think that 34 years of planning meals would have made it a natural reflex but instead, it was a breaking point. Watch for those. The key is to HAVE a plan. Lack of a plan leads to too many convenience foods and drive-thru meals. The second key is to keep the plan SIMPLE. No forms to fill out, no five-course meals. Keep it doable and delicious. Making our meal planning a team effort had a few false starts and adjustments, but it’s settling in now. Our Monday grocery run has turned into an anticipated outing. Sometimes we do some fun shopping first, before heading to the grocery store. The girls are learning life skills and doing more of the cooking. I’m relieved to get help and we’re eating better. It’s a win-win situation. Is there a household system your family has outgrown? How could you tweak an existing routine to fit your current life situation? Another great post as usual! We are about to embark on a new adventure for our family and I am rethinking some of our “old ways”. I wanted to comment on how wonderful it is that you looked at your husband cleaning the pantry as romantic…what a great example you set for other wives! I could see myself taking it personally that he doesn’t think I am keeping things clean enough instead of being thankful for the wonderfully helpful man God has blessed me with! You inspire me as a mother and a wife! Thank you so much for sharing your life! Ha! I hadn’t thought of that–there was a time when I would have felt that way, I think. Now that I’m busier than ever I’m glad for every bit of help! Just different perspective in a new season of life. Another good word, Charlotte. How old are the boys who are still at home? I love training my sons and my daughters to do the cooking, cleaning, etc., so they will be a blessing to the spouse some day. Training the boys up in domestic tasks are important too, not just the girls. For meal planning and trying new meals, I have been freezing ingredients for crock pot meals that are Trim Healthy Mama approved. Have a great day! We only have one son left at home, and that’s hard to believe. He’s 18, the youngest of our six sons. All of my boys did some cooking and shopping, for sure, and they all know how to do laundry, clean house and even decorate, lol. Great idea on the crockpot–one of my goals is to use it often this school year! Ugh…..I dread the grocery store. It has become a burden. I fix meals and the big kids complain it’s not fancy enough -too boring. The little kids just don’t want to eat new things. I think I need to come up with a new system. This post is spot on. I will have to be a little creative in my solution because I’m not taking the little ones to the store. I think with this last pregnancy and not having an appetite put me in a position of convenience foods because I didn’t want to eat and the smells of food made me nauseous. Obviously what I am doing is not working and what I’m not doing isn’t working. So, like you said, change it. And that is what I’m going to do. I guess I was just focusing on the negative instead of working out to get a positive. Thanks! ???? Glad to help, Leah–sometimes just a little thing will spark a new idea! Have fun with your kids in coming up with a new system. I have been surprised at how I now look forward to the grocery trip because it’s a fun time with the girls! I think I’m at the same point. It is funny how much of a change it is when the numbers and ages of kids change. I realized I relied in my older ones (now out of the house) to do a lot and have been lax in training the younger ones. I am finding too that I’m buying lots of paper towels and rice pilaf then we don’t have other things that we need so I’m making extra trips to the grocery store. I like your idea of having everyone involved. Soooo true, Sue! Sometimes I’ll realize that the younger kids have never seen a certain movie or listened to a read-aloud because they were too young to remember or not born yet! Some of the things we used to do don’t work anymore. I try to stay aware of stress-producing situations in our home management, then figure out a new way to do things!